The much-hyped arrival of Queen's Baton Relay, being carried out for the 19th edition of the Commonwealth Games, one of the major sporting extravaganza slated to be held in New Delhi in October this year, turned out to be a lacklustre affair as the enthusiasm was clearly lacking among sports lovers here. Due to sultry weather and in the absence of proper publicity ahead of the event, the Ludhianvis stayed away from the much-awaited event. Only sportspersons were seen partcipating in the event. Over 100 volunteers, led by Raja KS Sidhu, general secretary, Punjab Olympics Association, carrying the baton in a decorated vehicle, reached Parker House on the Punjab Agricultural University campus, where it was received by Ludhiana Deputy Commissioner Rahul Tewari, PAU Vice-Chancellor Dr Manjit Singh Kang, and Additional Director-General of Police, Punjab, Rajan Gupta. After a brief halt there, the relay resumed its journey. Hira Singh Gabria, Minister for Jails and Tourism, Punjab, accompanied by PS Gill, Director General of Police, Harish Rai Dhanda, Chief Parliamentary Secretary, Punjab flagged it off. Former international athletes, Jagdev Singh and Joginder Singh, along with hockey Olympian Balbir Singh of Railways and Major Singh were the first to start the relay. The relay accompanied by volunteers, a group of Punjabi dholwalas and the Games mascoT, Shera, proceeded towards its local destination, Government College for Women near Bharat Nagar Chowk on the Ferozepur road. Enroute, a handful of sports lovers arranged water “chhabeels” at two places. 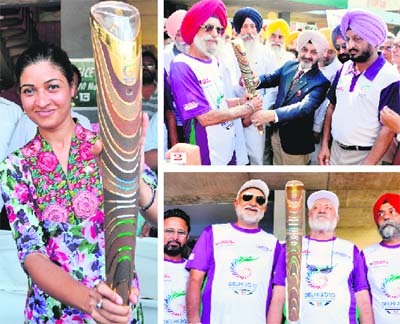 Those who took part in the relay during its march included Nirmal Singh, Daljeet Singh Lalton, Hakam Singh, Satinder Singh, Gurpreet Singh, Jasmine, Dharam Singh Uppal, Hakam Singh (Dhyan Chand awardee), Joga Singh and Amandeep Kaur (athletics), Sharanjeet Kaur, Pushpinder Kaur, Sukhvir Grewal, Hardeep Singh Grewal Neeta, Daljeet Singh Grewal (hockey), Kehar Singh, Sumer Singh and Mukesh Kumar (wrestling), Ashish Arun Gill, etc. It took half an hour for the relay to reach Government College, where gold medal winner in weigthlifting in the Games, Parvesh Chander Sharma, handed it over to Raja KS Sidhu for its journey to Patiala. Domicile status came in the way of arguably one of the deserving candidates to hold the Queen’s baton.Arjuna awardee weightlifter Tara Singh, who has 38 National Games records under his belt, was not allowed to run with the baton during its relay. Reason — he does not belong to the city. Tara Singh, who hails from Sood Makhsudpur village falling in Nawanshahr district — now known as SBS Nagar — came all the way to the city hoping that he would be given the honour of holding the baton, but he was left dejected when he was told that the baton would be relayed by the players belonging to the Malwa region. Rubbing salt on the wounds of the renowned weightlifter, the Commonwealth organisers did not offer him a T- shirt, especially designed for international players. Tara Singh, who has the distinction of being the first and the only Indian weightlifter to register a medal in the clean and jerk category in 1982 Asian games, was told to stand in a corner. Fortunately, the veteran weightlifter caught the attention of Raja Sidhu, general secretary Indian Olympic Association (IOA), who quickly grabbed an official T- shirt for him and introduced him to the dignitaries and other international players. Though, he was seen running with the baton, he was not allowed to hold it. Expressing his disappointment over the episode, Tara Singh said, "My birth place came in the way as I am from Nawanshahr. Had I been born in Jalandhar or Ludhiana, I would have been honoured by the organisers today." He further said, "I was told to report at Parker's House, but when I reached here I was surprised to see that my name was not in the list of players invited for the ceremony. I have no regrets as veteran players are used to such kind of treatment. The worst fear of elderly sports persons came out to be true during the Queens baton relay as several of them were seen getting dehydrated due to heatstroke. The callous attitude of the administration came to the fore as none of the administrative official was seen present at Parker's House, once the Queen's baton headed for the relay towards its destination in the Government College for Women. For 75-year-old veteran athlete Daljit Singh, who represented two Asian Games in Tokyo (1958) and in Jakarta (1962), respectively, and won four gold medals in 800m race event and relay events was seen standing with the support of a table. The veteran athlete, who is suffering from Parkinson’s disease, was supporting a walking stick. He struggled to stand at the venue for nearly an hour but none of the organisers was there to offer him a chair. Yadwinder, son of the veteran player, drove his car near Daljit Singh and made him sit in the vehicle. "It's too hot outside, we were told that the Queen's baton would arrive at around 1: 30pm and we were told to report on the premises at around 11am, but the programme was delayed for more than two hours. Now I have to rush him home quickly," said Yadwinder Singh, visibly concerned about the health of his father. The veteran players complained that some one from the administration should have stayed at the venue to look after the players. "I told you yesterday also and I am reiterating it. The Babus have stood true to my words. They have treated the occasion as a liability. Look none of them is here to offer us water," said the former Olympian. Terming the Clinical Establishment Bill as a move of the Central government to eliminate small hospitals and clinics, city doctors observed a "black day" today by organising protest meetings in small groups. The district chapter of the Indian Medical Association (IMA) staged a protest against the “anti-doctor” and “anti-people” policy of the government at the IMA house here. The IMA has threatened to step up its agitation to get the Bill recalled. Doctors at private clinics and hospitals in the city, including SPS Apollo, GTB Hospital and Raghunath Hospital, also joined the protest by wearing black badges at work. Clinics and hospitals were marked with black flags and banners reading, "the anti-patient and anti-doctors policies of the government are making treatment costly". Dr R P Singh, cardiac consultant at SPS Apollo Hospital, termed as ridiculous the requirement for government hospitals to assign three nurses for each bed in clinics under the provisions of the Bill. "Forget adequate nursing staff, the Civil Hospitals do not even have a sewerage system, while the government is demanding five-star facilities from the small clinics, nursing homes and hospitals," said Dr Singh. Dr Narottam Dewan, district IMA president, said the government was committed to providing health-care facility to every citizen by 2000. Instead of doing so, the government is imposing "taxes" on the treatment. "Every medicine and healthcare equipment is subjected to tax. For example, a tablet which in reality costs Rs 15 is sold for Rs 80 after being taxed," said Dr Dewan. In order to streamline the healthcare system in the country, the government should give subsidy to the private healthcare system, which is providing 90 per cent services to the Indian populace, as it will curtail the cost of treatment, suggested a group of doctors. Dr Hardeep Singh, district IMA secretary, said the government was coming up with this Bill only to favour big corporate hospitals and crush small hospitals and clinics. With this Bill, small hospitals will not be able to fulfil all conditions. Rather it will help corporate hospitals to have a free monopolised market with high costs of health care, while small hospitals and poor people will be the sufferers with this move. Objecting to the provision of powers to Chief Medical Officers (CMOs), the doctors said, "Already we are scared of the arbitrary practices of the health authorities. Now if the CMOs will be vested with the powers to impose a Rs 5-lakh fine, it will add to corruption. Rather, the CMOs should devote time to promote the public healthcare services and national health programmes. District police, Fathegarh Sahib, and Desh Bhagat Institute of Advance Computer Sciences, Mandi Gobindgarh, organised a seminar on the occasion of International Anti-Drug Addiction Day. Youth Development Board chairman Gurpreet Singh Raju Khanna was the chief guest. Khanna said Punjab government had been taking initiative to control drug addiction among youth in Punjab and encouraging them towards cultural and sports activities, like recently World Kabaddi tournament, which was organised by Deputy Chief Minister Sukhbir Singh Badal proved a major success towards enlightening the youth in Punjab. He said capturing of drugs in large quantities in Punjab during the past three years was proof of Punjab government’s efforts to minimise drug addition. Government has established sports clubs and sports wing to encourage youth towards sports, he added. DSP Amloh Gursewak Singh was the special guest. He said it was necessary to control the growing craze of drugs among youth and therefore strict legal action must be taken against drugs’ supplies. Desh Bhagat Group chairman Dr Zora Singh said the group had organised 23 anti-drug addiction camps, seminars and functions with the support of the Punjab Police to remove the drugs menace in Punjab. Director general of the group Prof Shalini Gupta said continuous efforts were required to stop drug addiction in Punjab. She added that Desh Bhagat Group had adopted several villages near Amloh for development of poor people by providing them basic necessities and free education. Amloh SHO Ajaypal Singh, Mandi Gobindgarh SHO Harpal Singh, Gurmeet Singh Khaira, Punjabi University, Patiala, ASI Salana Balbir Singh, Karamjit Singh Bajwa, Sarabjit Singh, SAD city chief Darshan Singh Cheema were also present. Terming drug addiction to be the main hurdle in ideal development of wards of certain professions like transport, garage management and automobile repair, the police has launched a co-ordinated movement to monitor family affairs of addicts desirous to get rid of the menace. Special teams of physicians and counsellors have been constituted to identify the target groups and supervise drug de-addiction treatment of interested persons. The police also announced to felicitate enthusiasts and arrange free education of their wards. Investigations by the The Tribune revealed that the police had launched a co-ordinated movement to identify and retrieve drug addicts whose families had suffered on account of economic and social setback. Impressed by arguments of speakers during seminars on causes and consequences of drug addiction, a large number of addicts, including drivers, cleaners and automobile mechanics expressed their willingness to undergo de-addiction treatment today. The seminar at Kup Kalan was presided over by Ravinder Puri, councillor, and Amrik Singh, chairman, market committee, Ahmedgarh, was the chief guest. Speakers, including SHO Amritpal Singh Sadar, Balwinder Singh Billu, president of the Truck Operator’s Union, Kup, and Dr Sunit Hind pointed out that majority of addicts had fallen prey to the menace due to the misconception about strenuous work and relieving of fatigue and pain with administration of psychotropic drugs and narcotics. Elaborating on the move launched under the supervision of SSP Sangrur Nau Nihal Singh, Gurpreet Singh Sikand, DSP Amargarh said all SHOs and beat officers had been advised to constitute special teams of physicians and educators in their respective areas. The teams will identify the target groups and persuade desirous addicts to undergo de-addiction treatment. The police will also take care of the rehabilitation of the subjects coming forward for de-addiction, he added. Regretting that education and development of wards had been affected adversely due to drug addiction, Sikand maintained that the authorities had drafted a project for free education of children of addicts undergoing de-addiction treatment. “We have already co-ordinated with certain government and non-government organisations, which will provide free education to students recommended by teams monitoring the programme. Free hostel facilities will be available for girls,” said Sikand. The Punjab police along with the Punjab Medical Representative Association (PMRA) in its drive against narcotics, drug abuse and its repercussions on society at large organised a play at Sherpur in Ludhiana. Rang Manch Rang Nagri presented the play directed by Tarlochan Singh. It passed a strong message about the bad affects of AIDS, narcotics and drugs that could ruin the personal, family health and life. Mayor Hakam Singh Gyaspura, chief guest, lauded the Punjab police efforts for carrying out the drive. Sushil Kumar, ADCP, was the guest of honour. He assured people that the sale of drugs and narcotics would be checked and defaulters/law breakers would be taken to task. City MP Manish Tewari today rapped Chief Minister Parkash Singh Badal for his attempts to exploit the alleged public sentiments by raising the issue of the distribution of water in a wrong way. Referring to the recent statement of the Chief Minister about demanding royalty on water from neighbouring states of Haryana and Rajasthan, Tewari pointed out that he (Badal) was deliberately making such impracticable statements while burying the real issue. “The Chief Minister is simply trying to use diversionary tactics by issuing such statements and holding all party meetings,” Tewari said during a public meeting at Mullanpur Dakha near here. He pointed out that the matter was with the Supreme Court of India. So what will Badal get out of the all-party meeting? Badal seems to have no faith in the team of lawyers he had hired, Tewari observed. The MP claimed that it was during the Congress regime under the leadership of Capt Amarinder Singh that the government got a law passed in the assembly to save Punjab waters. Tewari said Badal was trying to use such diversionary methods only to divert the attention of the public from the failures of his government which is surviving with the aid of the central grants. He alleged that the central aid was being directed towards building hotels in Gurgaon for the Badals and warned that once Congress came to power, all these issues would be thoroughly inquired and investigated. Among others present on the occasion included former minister Malkiat Singh Dakha, senior party leader Jagpal Singh Khangura, Telu Ram Bansal, Major Singh Mullanpuri, Pawan Dewan, Nahar Singh Gill, Manjit Singh Bharowal and Manjit Singh Hambran. The development of small-scale industry is the sole responsibility of the state government but the Akali-BJP government is always alleging step-motherly treatment by the Centre although most of the development activities and industrial packages in the state are funded by the Centre. Speaking at a workers’ meeting near Sangeet Cinema here today, Tewari said instead of criticising we should think and work for the development of the state so that Punjab, which has been derailed, was put back to its original position. Tewari was conferred with the honour of "Voice of Ludhiana" for the development projects initiated by him after becoming MP. The meeting was organised by KK Bawa, ex-president, PPCC, and block president, Harbans Singh Panesar. Others dignitaries present were ex-minister Malkit Singh Dakha and Surinder Dawar, ex-Mayor Nahar Singh Gill, Sushil Malhotra and PPCC general secretary, Pawan Dewan. Two cyclists sustained grievous injuries after being hit by a speeding private bus near Kohara at about 8 pm last night. A highway police patrolling party took them to a private hospital from where they were referred to a hospital in Ludhiana. But, he died on his way to Ludhiana. They have been identified as Randhir Singh (60) of Bijlipur and Gurpreet Kaushal (35) of Ghulal village near Samrala. Both of them were working in factories located at Focal Point, Ludhiana, and were returning to their homes on a bicycle. The bus has been impounded and the driver arrested under Sections 279, 304 A and 427 of the IPC. The bus driver has been identified as Kulwinder Singh of Behrampur district in Ropar. The bodies of the victims were handed over to their guardians after the post-mortem examinations. Owing to the non-cleansing of the water supply tank in E Block of Shaheed Bhagat Singh (SBS) Nagar, residents living in Housefed houses are constantly falling sick after drinking its water. Having failed to receive any response to their complaints registered with the area welfare society, residents today purchased a water testing kit from Punjab Agricultural University (PAU) and were shocked to find that the water they were taking was turbid. "As per the directions on the kit, the water colour specifies that it is unfit for drinking, thus we are giving a formal complaint to the Civil Surgeon to take water samples from the area," said SBS Nagar resident Gursimran Singh Mand. The so-called super deluxe flats in the area are getting drinking water supply from the water tank, which has not been cleaned for months. 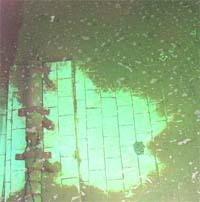 The contents deposited in tank included bricks, muck and plastic materials. A number of residents, including children, have fallen sick in the past two months. Some people are also undergoing treatment at private hospitals for diarrhoea and mild gastroenteritis and have been advised to drink boiled water. Pointing out at the paradox of living in a posh locality and drinking dirty water, a teacher said the authorities concerned should be taken to task for playing with the health of the residents. Said Malkiat Singh:"Even our RO systems get green and grimy residue despite being cleansed every week. There are many people who have simple water filters that can't filter microbial impurities of all kinds, making them highly prone to water-borne diseases." The residents have decided to file a complaint to the Ludhiana Deputy Commissioner, Ludhiana Municipal Commissioner and Punjab State Human Rights Commission in this regard. They also called upon K K Bawa, chairman of Housefed, to look into the matter. People who don’t want to travel in autos packed with passengers or can’t afford hired cabs, will now be able to call chartered autos on a telephone call.Dhanda Autoneeds has launched the much-needed service in the city and chosen 4545454 as their telephone number. Harish Rai Dhanda, chief parliamentary secretary, flagged off the fleet of 20 vehicles. If claims made by Sanjay Dhanda and Gautam Maini, managing directors of the company, are to be believed the city residents and those visiting its various parts will be able to avail personalised and safer transport service at Rs 8 per kilometer within the municipal limits. Unlike passengers of usual autos, occupants of the special vehicles painted in blue, will be able to converse on mobile phone as noise pollution is near zero. The organisers have assured to maintain air pollution too near negligible. “After studying the needs of the common man and their problems during odd hours, we have taken every care to ensure safety and comfort of those using our service. Antecedents off all drivers and staff attending calls of the clients have been verified before appointing them,” claimed Dhanda adding that even fingerprints and other biometric specifications of all concerned were saved in software. “Time bound home delivery of munchies and that too at the cost of a life! No way warranted!” Even the customers agree but fail to think rationally when personalised. Although many fast food joints and eateries assure timely home delivery, but some have even gone to the extent of time bound delivery which may prove fatal for the supplier as well as the multiple receivers on the way. “It is good to value time but to over value it and that too in the present set up where there are teeming millions on the road, is an issue which requires serious thought. It has been generally viewed that the time-bound delivery of these items has become a source of nuisance for one and all. The fiery speed at which these suppliers ply in order to prove their worth in terms of timekeeping can lend many a road users or for that matter pedestrians, in trouble” said a commuter. “I had narrow escape the other day when one such supplier, who was no doubt in a hurry to deliver at the earliest possible or had to face the heat, took a sudden turn and was about to bump into me but somehow I saved myself with the grace of god” he added. “It has been witnessed that these suppliers ply the maximum during evening time when as their customers relish munchies with their evening tea. In order to ensure time-bound supply, they leave the main road and make use of short cuts i.e. though streets and small lanes where small kids are busy playing and enjoying” complained a housewife. The mother of one such kid was rued at the manner in which these suppliers ply and added that her child had on numerous occasions escaped unhurt. “The administration should keep a check on the punctuality issue of these joints lest a road user should be caught unawares and is forced to pay through the nose for no fault of his. Although the conditions always apply in home deliveries but all norms are thrown to the winds when the supplier as well as the receiver has only one ‘mania’ hovering at the back of the mind, timely delivery on one hand and time-bound receipt on the other” said another commuter. “Is it really feasible to claim such swiftness on these overcrowded roads? Does such a provision logically seem good when there is a question of the safety and security of the general public? We should learn civic sense and try to realise the value of time in our daily dealings but measuring time in terms of quantity is no way acceptable. Getting over possessed and crazy may prove to be fatal at times. Lives are definitely more important than munchies. This over craziness of joints needs to be checked at all costs,” viewed another commuter. Safeguarding nuclear weapons, technological advancement and use of nuclear energy for food, agriculture, water processing and power, increasing the role of armed forces in reformed security calculus, evolving positive and constructive state behaviour are the key issues that need to be addressed in the context of nuclear security, said Milan Naidu, Lt-Gen and Former Deputy Chief of Army Staff, while addressing members of the Ludhiana Management Association on the topic "Nuclear security and its implications in India". Dr KNS Kang, general secretary, Ludhiana Management Association, informed that India went nuclear in 1974 with Pokhran-I followed by Pokhran-II in 1998. 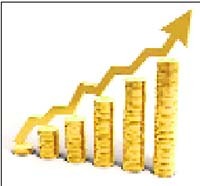 Gold prices have seen a record increase in the past a few months. Gold, which the Indians earlier bought for an investment purpose, is now out of their reach. Now, its price of Rs 18,910 per 10-gram is making people to shy away from buying it. The demand of the yellow metal failed to increase even during the wedding season or during festivals like Akshaya Tritiya. There was a time when gold was easily available at Rs 250 per 10- gram, but today the wagering in the international market is rapidly increasing its price. “We have always demanded that the wagering should be stopped otherwise we would be in ruined, but nothing has been done so far,” said Virender, a jeweller at Sarafan Bazaar. He further added that they need a stable market for the smooth functioning of the business and at present there was only 40 per cent sale of gold as compared to the last year. “Although the marriage season has set up but the jewellers are sitting idle,” he rued. Kuldeep Kaur, a housewife, who once bought gold at Rs 300 per 10 gram, is surprised at its sky rocketing prices. “I have never seen such a steep hike in the price of gold. We use to buy gold not only on weddings or festivals but also in between whenever we had some extra money as it was a kind of investment for us. But with the ever- increasing prices it has now become out of our reach,” she said. In order to fight with shortage of sand and gravel following blanket ban on the mining along the riverbeds in the state by the Punjab and Haryana High Court, people of the area have started using mud mortar to fix the bricks. Being easier to work with, masons and labourers are also happy over reemergence of the use of mud mortar for constructing buildings. However, building contractors are finding it difficult to convince their clients about tangible and intangible advantages of replacing cement-sand mortar with mud-mortar. A random survey revealed that majority of owners of under-construction buildings and owners of plots purchased recently have started using mud for preparing mortar for constructing walls at least. Lime mortar was used to seal the gap between bricks and plaster the walls. While a few of them purchased the soil and loam from suppliers others preferred to dig pits in their plots to procure mud for the purpose. Karam Singh of Kilaraipur village in Ludhiana district, a mason working at Dehlon, said mud was better than cement and sand in many ways for preparing mortar. Besides being easy to work with, mud mortar acted as an insulator for the heat. “Houses built with mud mortar proved to be more comfortable than those constructed with cement sand mortar. Insulating packing between bricks acted as a conditioner and kept room warm during the winter and cool during the summer as it is almost bad conductor of heat,” said Karam Singh. Maintaining that using mud instead of sand facilitated reuse of bricks after the building is demolished for any reason, Rajesh Sharma, a building contractor, said it was difficult to convince owners of buildings about advantages of the traditional method of construction. “Though we have resorted to mud mortar due to the ban, we found it more advantageous. Elderly members of families owning under-construction have also appreciated the trend but it is difficult to convince about advantaged of mud as fixer,” said Sharma. He said a few of his clients had agreed to get their houses constructed with mud after negotiating rates. Both building contractors and common man are feeling the pinch of unprecedented hike in the input costs following the ban. Rakesh Kumar, a resident of a nearby Sindhwan village, died for the want of blood transfusion as Gurmukh Singh, a resident of the same village could not reach Ludhiana Hospital due to the heavy traffic and lackadaisical attitude of Ladhuwal toll plaza employees. Gurmukh was supposed to donate blood to Rakesh. Ravinder Rinku, vice-president, Goraya Nagar Panchayat, alleged that ailing Rakesh was in dire need of blood transfusion. His brother, Gurmukh, was on his way to Ludhiana to donate the blood. But the toll plaza employees did not allow him to pass through a separate lane during the rush hour. Though he had a valid pass of a daily commuter, all requests of his fell on deaf ears. He remained stranded at the plaza for 20 minutes. Rinku alleged that the patient waiting for the blood transfusion. As per the agreement between the government and toll Plaza Company no vehicle could be stopped for more than three minutes. Moreover, a separate passage remained cant for emergency vehicles, including VVIPs vehicles. Though the police nabbed the killers of Vikramjit Singh, son of an industrialist who was kidnapped and murdered four years ago, but the victim’s family is demanding extradition of key conspirators who are allegedly conducting their criminal activities from Dubai and the United Kingdom. As the family today observed the fourth death anniversary of their only son, they said though the police had already arrested the criminals, they still feel that justice was not done. According to sources, the police has arrested the kingpin Jagminder Singh, along with his two accomplices Ravinder and Ranjit Singh in kidnapping and murder case, but the UK-based NRI Parduman Singh and his close aide Shekh Hassan of Dubai are still moving freely. Emotionally choked Rajinder Singh, Vikram’s father said though the police has arrested the killers, their masters who were sitting in the United Kingdom and Dubai were still to be extradited by the police. “The police has no information on whose behest the accused killed my son,” said Rajinder. He said Parduman was the key conspirator. “He was once lodged in Tihar Jail, where he met Jagminder and conspired to kidnap Vikram. After kidnapping the victim, Parduman and his accomplice Shekh Hassan, called up from Dubai and demanded ransom,” said Rajinder. Parduman had been named in the FIR as a co-conspirator, but no action has yet been taken to extradite him. “The police should have interrogated the accused and extradited the conspirator to solve the murder mystery,” said Rajinder. Earlier, the accused exploited the legal lacuna and tried to prolong the proceeding, but the judiciary took serious view of the case and now it is being head on fast track basis. The family is awaiting verdict, which would be announced soon. Vikram's kidnapping and murder had shook the city four years ago. Son of a leading bicycle manufacturer, Vikram was kidnapped for ransom and was found murdered in Himachal Pradesh. It’s been four years since Vikram's family lost their only son to abductors, who kidnapped him for ransom but his family has not been able to come to terms with reality as they still have no clue why the perpetrator of his crime eliminated him for money. They are awaiting verdict as a local fast track court is trying his case. They lost their son to the greed of one Jagminder Singh and would not be able to forgive him ever even if the court sentences him to a rigorous punishment. Jagminder's life as a criminal is no less than any Bollywood flick. Urge to make quick bucks and girlfriends forced him into the dark world of crime. Jagminder, who used to speak English, was equipped with a significant degree in computers and could have opted for a career in corporate sector like any other youth, but he chose the easy way out to make quick bucks without realising the consequences. A resident of Canadian Enclave, Ayali Chowk, Jagminder kept on adopting new identities to hoodwink the police and travelled India and abroad. He even possessed a fake Identity card of a journalist with a British newspaper. He entered into the world of crime in 2000 when he came in contact with his cousin Harvinder Singh, alias Bittu. They stole a car and were later on arrested by the Ludhiana police in 2000. They were also arrested in a car theft case at Bathinda and later on got bail. During this time Jagminder became friendly with a girl named Sonia Sirohi of Jodhewal Basti. To fulfill his girlfriend’s demand he again formed a new gang with Ranjit Singh aka Ghukki and Rajinder Singh and all of them stole a bag from a car from The Mall Road. They were arrested and were bailed out after which they went to Delhi and joined Brahma gang with his friend Subash. This gang kidnapped Amit Gogia and later on gang leader Brahma was killed in an encounter with the Delhi police and Jagminder, along with others, were arrested at the New Ashok Nagar Police Station in 2001. Another murder case was registered against him at the Vasant Kunj police station, Delhi, in June-2001 and he was arrested and sent to Tihar Jail. He remained in Tihar Jail from June, 2001, to September, 2003. In September, 2003, he came to Bathinda for appearance in a court case from where he escaped from the police custody with the help of his friends Amardeep Singh and Talwinder Singh. After this he started living in Kochar Market area in the city as a tenant till 2004. The police raided this house, but he escaped to Sonepat, where he met Pardeep, who took him to Ghaziabad. Their Jaminder, was also behind the dacoity at Nakshtra Diamond Showroom, Sector 39, Noida, in March, 2004, and ran away with jewellery worth Rs 60 lakh. After this he came to Chandigarh. He stayed at a rented accommodation in Sector 8, Chandigarh, along with his accomplice. In August, 2005, he shifted to Sector 21. He sold diamond jewellery in Chandigarh and Amritsar. Jagminder along with Manoj Sharma, alias Shanty (whose father was DSP in Muktsar Jail then), Honey Sharma of Dhonla committed kidnapping Nipun Joshi, owner of Joshi Auto Zone, Chandigarh, on November 18, 2005. After kidnapping, Jagminder went to Singapore and made a ransom call. Later, on November 20, 2005 Chandigarh police arrested Manoj Sharma and Honey Sharma. After this Jagminder went to Nepal from Singapore via Bangkok and purchased weapons. In March, 2006, he came to Jaipur and established contact with his old accomplice Rajinder and Ranjit and kidnapped Vikramjit Singh. Jagminder conducted the conspiracy, along with the United Kingdom-based NRI Parduman. Vikramjit Singh was found murdered in Solan on June 29. He had gone missing four days earlier from Sarabha Nagar market.